This article is about the bioregion. For the island group, see Furneaux Group. For other uses, see Furneaux. 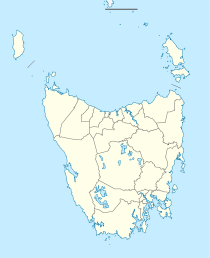 Furneaux is an interim Australian bioregion that comprises the Furneaux Group of more than one hundred islands off the northeast coast of Tasmania, Australia comprising 537,543 hectares (1,328,300 acres). Furneaux Island, located at the eastern entrance to Bass Strait, is home to a range of native plants and animals, including the Furneaux burrowing crayfish, a threatened species of crayfish in the family Parastacidae, endemic to Australia. ^ "Interim Biogeographic Regionalisation for Australia (IBRA7) regions and codes". Department of the Environment and Energy. Australian Government. 2012. Retrieved 10 March 2017. ^ "Interim Biogeographic Regionalisation for Australia, Version 7" (PDF). Department of the Environment and Energy. Australian Government. 2012. Retrieved 10 March 2017. ^ "Engaeus martigener: Doran, N. And Horwitz, P". 2010. doi:10.2305/IUCN.UK.2010-3.RLTS.T7737A12845688.en. Thackway, R.; Cresswell, I. D. (1995). An interim biogeographic regionalisation for Australia : a framework for setting priorities in the National Reserves System Cooperative Program, Version 4.0. Canberra: Australian Nature Conservation Agency, Reserve Systems Unit. ISBN 978-0-642-21371-6. This page was last edited on 17 February 2019, at 07:52 (UTC).